A new study suggests that camels are the major source of the Middle East Respiratory Syndrome, or MERS, a viral disease that has sickened 182 people and killed 79 of them since it was first detected in Saudi Arabia in 2012. The animals are most likely to infect people through respiratory secretions — from coughing, sneezing, snorting or spitting — that travel through the air or cling to surfaces. People with chronic illnesses like diabetes, lung disease or kidney failure, or other conditions that weaken their immunity, seem to be most susceptible, and should avoid close contact with camels, researchers say. Saudi Arabia has had the most cases, other Middle Eastern countries have had a few and a handful of travelers from that region have taken the disease to Europe. There have been no cases in the United States. Although people have infected one another, the disease is not highly transmissible among humans, so researchers say that unless the virus changes to become more contagious in people, the risk of global spread does not seem high. The new study provides the first evidence that the virus is widespread in dromedary camels (the kind with one hump) in Saudi Arabia, and has been for at least 20 years. Younger animals are more likely than older ones to be infected and contagious. The virus invades the camels’ nose and respiratory tract, but does not kill them. It is not known whether it even makes them sick. “It would be very difficult to know if they were ill, since these are creatures that slobber a great deal,” said Dr. W. Ian Lipkin, the senior author of the study and a virus expert at Columbia University’s Mailman School of Public Health in New York. Genetically, the virus found in camels matches samples from infected humans. The disease was not detected in people until 2012. It is not known whether the cases in humans are a new phenomenon, or whether they have been occurring but were not recognized. Some people develop mild respiratory infections, but in others the disease turns deadly, with worsening fever, cough and shortness of breath. 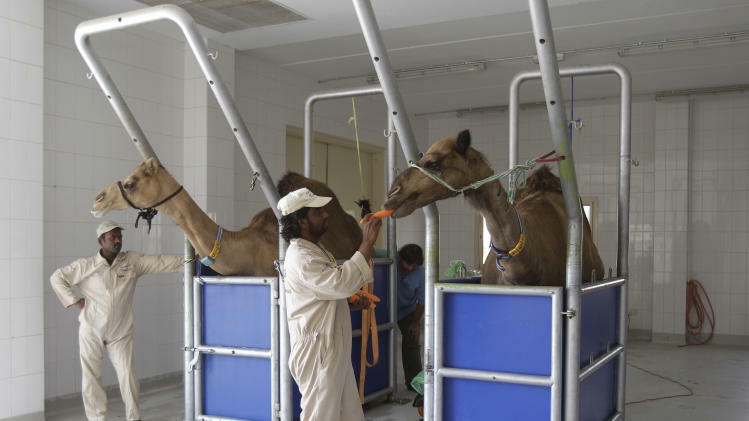 In some cases, patients were known to have been around camels, but until recently it was not clear whether the animals might be the source. Other cases have been complete mysteries, with no known exposure to animals or ill humans. Sick people have infected family members, health workers and nearby patients in the hospital, but the virus is not considered highly contagious among humans. Researchers do not know how camels become infected, but they suspect that the virus may have originally come from bats. MERS belongs to the coronavirus family, like SARS, the deadly and more contagious respiratory infection that began in China and caused a global outbreak in 2003. Bats are a host for SARS and other coronaviruses, and studies have found evidence linking MERS to bats. Scientists have identified a protein within the Middle East Respiratory Syndrome (MERS) virus that blocks further infection in cells. Shibo Jiang at Fudan University in Shanghai and his colleagues found that a type of small protein, also known as a peptide, prevents the virus from fusing with human respiratory cells. MERS-CoV enters into host cell mainly through membrane fusion mechanism and hijack its cellular machinery in order to reproduce. The peptide, called heptad repeat 2 (HR2P), has “good potential” for development into a future drug against MERS. So far, HR2P’s effects have only been studied on cells in a lab dish and not yet on animals — the next step in a long process to validate any new drug for safety and effectiveness. The first case of MERS surfaced in Saudi Arabia April 2012. It is considered a more virulent but less transmissible cousin of SARS, a so-called coronavirus that erupted in Asia in 2003 and infected 8,273 people, nine percent of whom died. There have been 180 laboratory-confirmed cases of MERS, including 77 deaths, according to a World Health Organisation (WHO) toll issued on Tuesday. The new infections bring the worldwide total of confirmed cases to 170 with 72 deaths, the WHO said. Four more people in Saudi Arabia have been infected with the SARS-like Middle East Respiratory Syndrome (MERS) virus and one of them – an elderly man – has died, the World Health Organisation (WHO) said on Friday. The new infections, including in two health workers from Riyadh who have not reported any adverse symptoms, bring the worldwide total of confirmed cases of the respiratory disease to 170 with 72 deaths, the United Nations health agency said. MERS first emerged in the Middle East in September 2012 and is from the same family as the SARS virus, can cause coughing, fever and pneumonia. Cases have been reported in Saudi Arabia, Qatar, Kuwait, Jordan, United Arab Emirates, Oman, and Tunisia as well as in several countries in Europe, and scientists are increasingly focused on a link between the human infections and camels as a possible “animal reservoir” of the virus. In Friday’s update, the WHO said the latest MERS death – a 73 year-old man from Riyadh – had reported having contact with animals but had no travel history outside the Riyadh region. The fourth case, in a 53-year-old man from Riyadh, was after contact with a previously confirmed MERS case. He was hospitalised on November 26 and is currently receiving treatment in an intensive care unit, it said. Dutch and Qatari scientists published research earlier this month that proved for the first time that MERS can also infect camels – strengthening suspicions that these animals, often used in the region for meat, milk, transport and racing, may be a source of the human outbreak. The WHO said people at high risk of severe disease due to MERS should “avoid close contact with animals when visiting farms or barn areas where the virus is known to be potentially circulating”. For the general public it advised normal hygiene steps such as hand washing before and after touching animals, avoiding contact with sick animals and good food hygiene practices.